Max Boykoff giving an introduction at CSTPR’s 15th Anniversary on September 28, 2017. 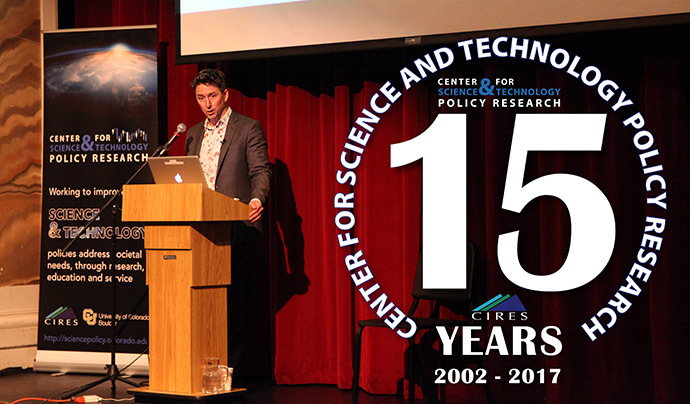 This year, the Center for Science and Technology Policy Research (CSTPR) celebrates its fifteenth anniversary since being recognized as an official University center in 2002. In its fifteen years, CSTPR has weathered major political, social and economic changes—not to mention some severe cold snaps. Through it all, the center has been an important bridge between science and policy for all of the faculty and students who have been involved, as well as the many CSTPR collaborators. To celebrate the anniversary, CSTPR hosted a keynote address by Brian Deese, Former Climate and Energy Advisor to US President Obama. At the event, Max Boykoff, current director of CSTPR, gave a short introduction in which he talked about the center’s beginnings. Avery called the period in which CSTPR was developed an “interesting and exciting time”—sentiments expressed by many of the people who were instrumental in founding the center and defining its goals. Boykoff, who arrived in 2009, says that CSTPR was already an exciting and unique place by the time he became director in January 2016. 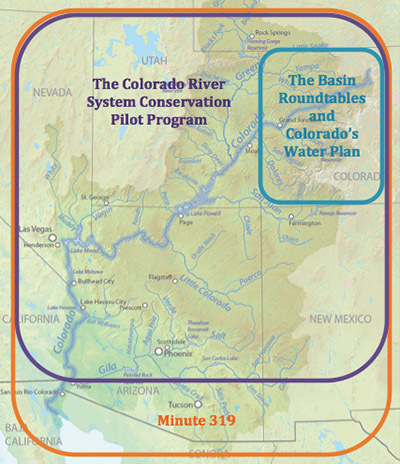 In 2016, Boykoff took the opportunity to clearly define the goals and priorities of CSTPR. Four themes solidify the vision and mission of CSTPR in 2017 and going forward. The first, ‘Science and Technology Policy’, involves studying decisions made at the science-policy interface. This theme describes studies of research processes intended to co-produce science between scientists and stakeholders—a critically important goal for those who want to make science immediately useful for policy makers and the public. ‘Innovations in Governance and Sustainability’, a key theme for many CSTPR researchers, involves studying how sustainability challenges can be addressed by policy. As climate change becomes increasingly addressed in policy, projects related to this theme continue to be incredibly important contributions that CSTPR makes. Similarly, pursuing research along the ‘Drivers of Risk Management Decisions’ theme, for example by studying how individuals and institutions make decisions to respond and adapt to perceived risks, can help us understand the ways in which governments can respond to crises related to climate change. 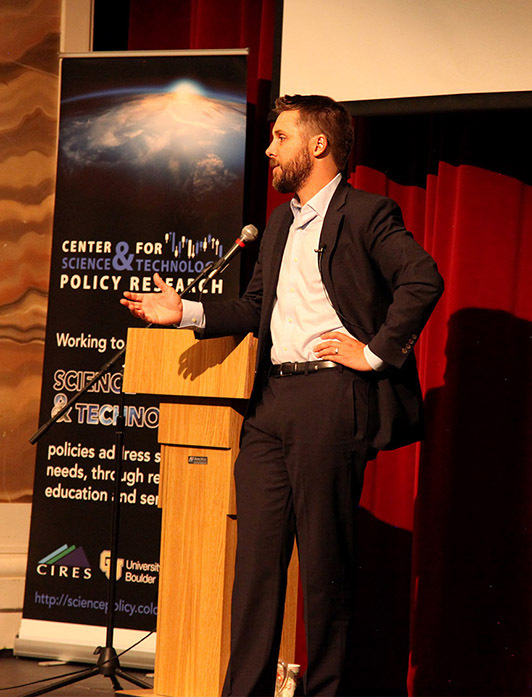 Brian Deese, former climate and energy advisor to US President Obama, giving a keynote address at CSTPR’s 15th Anniversary on September 28. Finally, projects in the theme of ‘Communication and Societal Change’ helps analyze how representations of science and technology can increase or hamper their reach and impact in various target sectors and in the greater public. Boykoff discussed how all four of the themes are clearly visible in the research projects being carried out by CSTPR scientists today. Students and faculty who have passed through CSTPR know well the importance that the center serves in the scientific and policy communities. Elizabeth “Bets” McNie, one of the first graduate students at CSTPR, spoke about the role that CSTPR played in her own career path. Over fifteen years, CSTPR has been in a unique position to house graduate students, visitors, postdocs, faculty, and staff who feel similarly, and has formed a strong network of scientists and researchers who feel passionately about combining science and policy research. Boykoff is optimistic about the future of CSTPR.